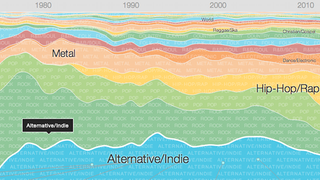 Google's research department just released a fun visualization called Music Timeline, which attempts to chart the rise and fall of different musical genres in terms of their relative popularity. Watch rock, pop, alternative, and hip hop each rise to the top. The chart begins in 1950 and reflects data about what Google Music users have in their music collections, cross referenced with each album's genre and release date. As a whole it paints a broad picture of the history of music that makes a lot of intuitive sense. Jazz is big in the 1950s. Then you see the rapid rise of rock in the 1960s, and hip hop in the 1980s. Zoom in on the metal genre to the thrash metal subgenre, and sure enough, you see it sharply increase in popularity in the early and mid-eighties when Metallica and Slayer were basically inventing the style. There's lots to quibble with, but the most important point is that the timeline reflects what people today think of music from back in the day. History has a funny way of banishing some artists, records, and even genres while resurrecting others.